The unique technology of creating balls as a single unit, not by fusing parts together, is used effectively by Xushaofa Sports to eliminate inconsistencies in performance. By getting rid of seams, we also got rid of unevenness in shape, weight and thickness that prevented a clean and accurate bounce in the past. 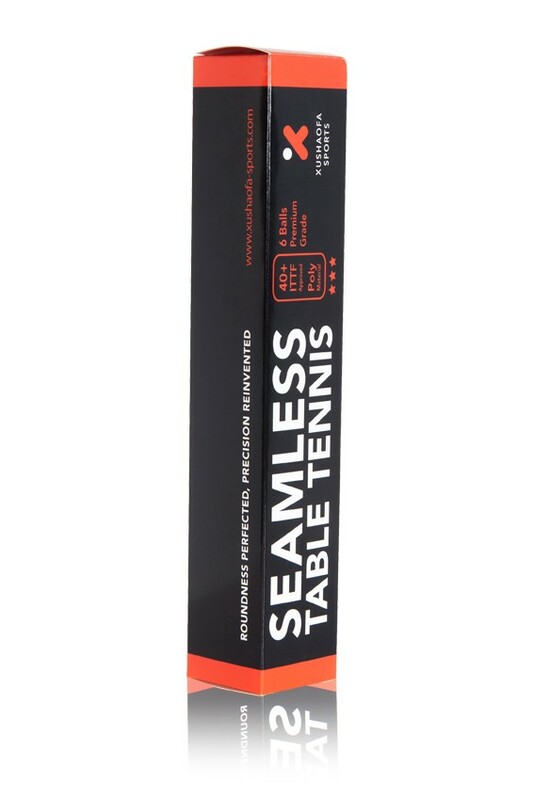 Seamless balls have no soft spots, are tougher, more durable, and consistent all around. 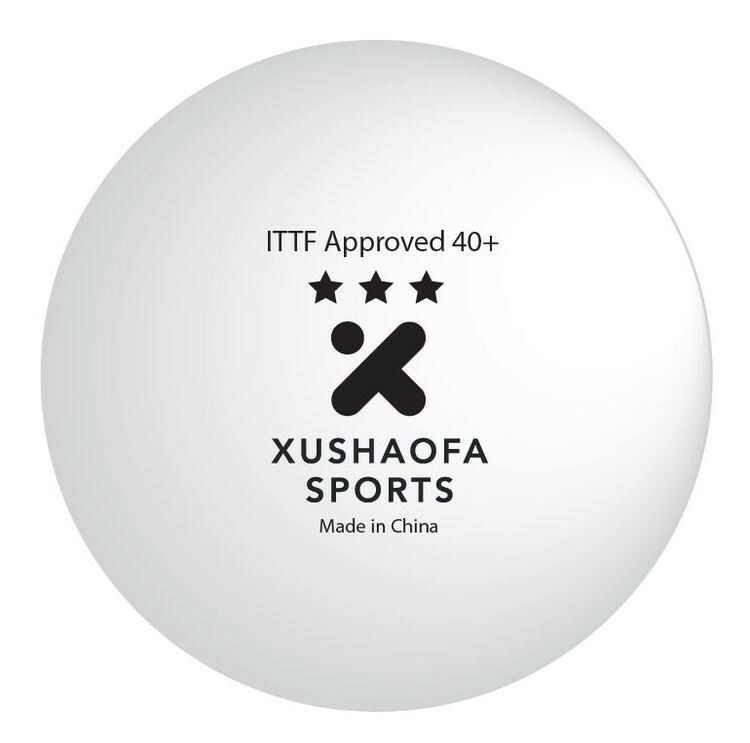 The Xushaofa brand has been approved by the ITTF. Best plastic balls this moment. Absolutely perfect balls. Highly recommended. The balls are very durable. My colleagues at work tried them and also loved them. Great service as well from TT11. Fast delivery. Rotund and durable balls. What else to expect for? These are really high quality balls, worth the price. We use these balls in our company table. May be 100-200 games of 11 a day. It lasts a week in average. Love playing with these balls. More cost effective than the Nittaku, and for my game, just as good. I would definitely recommend these balls... I will be buying more the near future. I played them for almost 2 months now, mostly outside on concrete tables with steel nets(!). They are still intact and play like fresh out of the box. The feel is very nice, not too hard and not too soft. I learned that my club is using them for league games and I can understand why. Reliable balls that are not too expensive. Bonne sphéricité, mais un peu légère, on sent un peu moins la balle qu'avec des nittaku et donc les effets sont plus difficilement maîtrisables. Nice feel, nice sound and durable. Definitely one of the best balls at this price! Excellent balls and good for tournaments. Verry good for the price!! Excellent quality! No complaints! Good balls, consistent and durable. Неплохие мячи - крепкие и достаточно весомые ... о геометрии не скажу что ах ... не все ровные , а в целом - рабочие мячи. There are the best balls I have ever played. Good choice. It`s OK but not top . Good price and durable. Not as good as the Nittaku. You paid what you got. A few straight out of the box are spherical, but didn't stay that way for long. Spēlējam praktiski tikai ar šīm [visos mačos vairākums arī], labs svars un cietība. Pašam ne reizi nav trāpijusies ar defektu, biedram, no aptuveni 10pakām trāpijās divas "līkas"bumbiņas [meta]. Lūzt no sitiena ar "ribu"visai viegli. Nice and consistent bounce. Sometimes ovalize after intense use. these balls are not perfect sphere, 2 out of 6 balls are defected. the rest are still good. the balls are cheap and good for beginners and amateurs. the balls also have a good durability. Izmantojam mačos, izskatās, ka spēlē pus Latvija ar šīm, turās ilgi, svars un forma regulāri, no 6 pakām esmu "saticis" vienu ovālu bumbiņu. There is a general agreement across the Internet that XSF makes the best seamless plastic balls in the world, and I concur 100%. Отличный выбор бюджетного мяча. Ровные и стойкие.Пока ребром не попадёшь. The best balls in the world!!! I always get XSF balls, they are fast and durable. Just don't hit them with the edge of your blade, table. Just stay away from hard edges as they will make these ball crack. Otherwise regular playing won't crack these balls. Most round 40+balls so far. I bought 10 boxes based on the high ratings of this product. I am very disappointed. Only 4 balls out of 30 were perfectly round, the standard I would expect from 3* ball at this price. 8-9 balls had an UNPLAYABLE wobble, you didn't even need to spin them to see the poor quality. Maybe I got really unlucky with a production batch ( the code stamped on the box is XHAE ) but I will never be buying XSF balls again. This was an absolute waste of money. Great cheap balls that lasts a couple of months before breaking. Its really a wonderful experience playing with top class tournament TT balls. Заказывал эти мячи по отзывам, шары хорошие на найтвердейшую четверку с плюсом, было 6 шт, за тренеровок 9-10 один сломал, из них 2 немножечко яичком, это не критично, а может и не 2, остальные 4 из коробки не доставал, они легче чем DHS, легче в игре, по весу не знаю, и они медленнее. Мой DHS long 3 с acuda s1t, и rackza 9, в макс толщие, с этими шариками ладит отлично, но стоит начать играть дхс, еще если не пластиковым, то они начинают казаться камешками, и ракетка их пуляет за стол. Вообщем я считаю что мячи норм. These are the best 40+ balls ever. Just 1 inside the box with irregular shape. I`ve already played a couple of weeks and non of them is broken! 24/10/2016 Great quality Review by J. Card. The best balls i've used so far, better than seamed 40+ DHS and Stiga. Look no further, Xushaofa are the best 3* balls on the market. They are the only truly seamless,with great bounce,durability and consistence. What we needed at a good price and quality. good balls overall , problem is the price and the durability. From a batch of 6 one was really oval. The rest was in perfect conditions and lasted a long time. I actually prefer Xushaofa and Joola balls over Nittaku Premium. The balls ordered recently is lighter than the ones ordered last year, it is better. Love this ball. If you cannot afford Nittaku premium, you may try this one. Хорошие мячи, иногда попадаются кривые. Но это везде так. Идеально ровных найти очень сложно. Ломаются только от ударов ребром и иногда при смэшах. В остальном хорошие с предсказуемым отскоком и долгоживущие. Жаль что в последнее время цены на них выросли. Одни из самых лучших безшовных мячей 40+. Over all, this ball is good on quality & pricing. The ones I ordered from this site break much more easily than the ones i ordered from my local supplier. I received the balls last month and only one is left now. It is top quality.it doesn't break easily. I play with a friend with this ball and it lasts so long really and playing is really nice with this balls brand, nice plastic option, highly recommended. 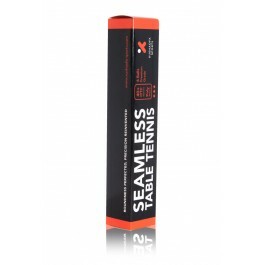 this is best seamless balls I ever played. Very persistent. Good product. Balls are seamless and round and keep their shape. Plastic seems a bit more dense when compared to some other balls. Overall a good buy for the price. Thanks TT11 ! round plastic balls, last long, very durable. Самый практичный пластиковый мяч на сегодняшний день. The ball is harder and more durable than celluloid balls. Because of these characteristics it feels as if the ball is heavier, but it's not. It is necessary to get used to it and find the optimal position and distance of the body from the table. After long use ball it is not broke, but lost the ideal round shape. Xushaofa seamless balls are the best balls on the market right now, they play close to the old 40mm balls, a little bit harder but bounce is similar. Weight is evenly distributed. Лучшие бесшовные шарики на сегодня. Excellent alternative to expensive poly balls. Consistent play with every ball in box, no wobble, good bounce, color stays bright after hours of play, lower breakage rate so far. Speed seems a little slower than nittaku+, spin about the same as nittaku+, bounce better than nittaku+. I would recommend for anyone who enjoys a quality poly ball. Самый долгожитель среди мячей. Спасибо магазину за подарки. Приобрел 15 коробок Xushaofa Sports *** мячей.Качество хорошее. Магазин оставил хорошее впечатление, работают быстро и четко. I really like these balls. they play slightly different than the nittaka 40 + balls, may be a little more reaction to spin. But they are fun to play and very durable. I've been playing with some for over six months and have still not broken one. Плотные мячи. В последнее время достаточно ровные. На мой взгляд лучшее что есть на сегодня. Estuve conociendo esta pelota en el Latino Masters de Ecuador. Me sorprendió la calidad y la duración comparada no las de marca DONIC, cuya calidad es muy errática. Por ejemplo, de una caja de tres unidades, una duró menos de dos minutos de entrenamiento, otra cerca de una hora y la tercera un par de días. Durante el torneo en Ecuador que duró cuatro días, sólo ví que se cambiara una pelota Xushaofa por rotura, Posiblemente la construcción sin costura (seamless) sea el factor que decide esa mayor calidad. I have to say I'm starting to like plastic balls. Xushaofa is one of the best out there. Good price too. Recomended! Best type of balls for TT. Quality one. Worth the price. Seamless and very round. Not as hard as other 2* plastic balls. Xushaofa could work on the durability a bit. One of the best plastic balls. These are the best plastic balls I've tried so far and at a great price. Buy seamless. Do NOT buy seamed balls. I really like these because they are durable, round and bounce slightly higher than equivalent Butterfly and Nittaku. i find them very good to play with. Some of my opponents say they are too hard though and they find it more difficult to control them. Wish balls would last longer. Solution: Don't play against hard hitters. Have yet to break the first ball, and the ball plays great. Will only buy these in the future. Хорошие,ровные и прочные бесшовные мячи. price is good...and product is very excellent ..
Great ball. Very good durability. Well worth the price. отличный мяч по приемлемой цене.покупал его у вас когда на него была спеццена-цена была очень хороша.теперь. I used other plastic balls with seam. They broke easily that make me worry thinking spending much money on balls. But Xushaofa balls are strong and durable that they don't break. and for me they are more close to cellular balls. I still prefer cellular balls though. It is no doubt XushaoFa Sports *** are the best balls to date. I had tried various 3 stars poly ball including Yasaka, Donic, Tibhar, Butterfly (the one that I most dislike).. but no one gave me the same feelings as I had with the Nitaku Premium 40. The XSF *** 40+ is exceptional. It has similar characters of old Nitaku Premium 40 but it is much more durable. My club use 2 balls to play 3 hours/day, 5 days/week and they last for more than 1 month (still playable) regardless a lot of devastating smash and powerful loops. Best of the best balls. The ball gives the player a good sense. It is very durable. I played with the ball more than a month and it is still alive :). It is not uneven and has no deflection while playing. Some of the best and yet most affordable premium 40+ balls so far. Other 40+ balls have a seam which makes them inconsistent and easily breakable. The only ball that is better is the Nittaku made in Japan (not the crap one Nittaku makes in China), which is very expensive and not as durable. Let me say that the new manufactured (2015) poly balls appear to be much better than those from 2013. The Xushaofa Poly balls are round, not one egg in the carton. I think all poly ball prices are still high (any store), TT11 has the best price. I think in a couple years the prices will go down. The covering lasts a longer time (doesn't go smooth quickly) and I'm not getting breakage. Лучшая из пластиковых мячей геометрия. Долговечные. Отскок самый близкий к целлулоиду! шариками доволен, приемлемая цена - качества. Excellent balls much better than the balls which are not seamless. Best balls I am playing 3 weeks continues BT balls are't break . Встречается небольшой эллипс, сам мяч долговечный. Sanırım plastik top olarak en dayanıklısı bu. Ayrıca sıfır falso. Небольшой овал присутствует, долговечней 40+ от DHS. Good ball and lasts long unlike Joola and Butterfly that breaks easily.